The new Democratic chairman of the House Judiciary Committee, Rep. Jerry Nadler of New York, is readying a subpoena to compel acting Attorney General Matthew Whitaker to testify later this month, a move that could become one of the first investigative actions of the new House majority that's promised closer oversight of the Trump administration. "We're preparing the subpoena," Nadler told ABC News. The order could be issued within days if Whitaker and committee Democrats can't reach an agreement on a hearing date before January 29, when President Donald Trump is scheduled to travel to Capitol Hill for his State of the Union address. Democrats have grown frustrated with Whitaker and the Justice Department because, they say, after committing to appear in January in a November phone call with Nadler and House Oversight Committee Chairman Elijah Cummings, D-Md., Whitaker's office has not agreed on a specific date to testify this month, citing scheduling difficulties related to the ongoing government shutdown, according to a source familiar with the discussions. Kerri Kupec, a Justice Department spokesperson, said the department "acknowledged the committee's request and proposed some dates in February" for a hearing. "We are severely short-staffed right now given the shutdown and we need staff to prep," she said in a statement. "Once the government re-opens, we requested notice of fourteen days which is standard for hearings." Nadler sent a reply on Wednesday, rejecting Whitaker's proposed hearing dates in mid-February. "We are willing to work with you to identify a mutually identifiable date for your testimony, but we will not allow that date to slip past January 29, 2019-the day of the President's scheduled address to Congress, when we know you will be in Washington," he wrote. While the Justice Department is one of a handful of departments and dozens of federal agencies affected by the ongoing partial government shutdown, 84 percent of the department is still at work, including Whitaker's office. The acting attorney general has attended White House meetings with congressional leaders and staff over border security and demands for wall funding that led to the shutdown. In his reply to Whitaker, Nadler pointed to the Office of Legal Counsel's 1995 guidance that states that the department "may continue activities such as providing testimony" during a funding lapse "if the Department's participation is necessary for the hearing to be effective." Democrats, who have repeatedly requested Whitaker's appearance, suspect the acting attorney general, who served as chief of staff to former attorney general Jeff Sessions until he was controversially promoted by President Donald Trump, is hoping to delay an appearance until after Bill Barr, Trump's new attorney general nominee, is confirmed by the Senate. "You don't get to shut down the government and use that as a reason to avoid accountability," Rep. Eric Swalwell, D-Calif., a member of the House Judiciary and Intelligence Committees, told ABC News. Barr began meeting with Republican senators on Wednesday, and his confirmation hearings are scheduled to begin next week. "The Democrats on the committee are very committed to bringing Mr. Whitaker before the committee," Rep. David Cicilline, D-R.I., a Judiciary Committee member, told ABC News. Whitaker, a former U.S. Attorney from Iowa during the Bush administration, made comments in writing and on television critical of special counsel Robert Mueller's investigation before his hiring as chief of staff to Sessions, expressing skepticism about Mueller's ability to investigate the president's finances, and defending Donald Trump Jr.'s controversial meeting with a Russian lawyer promising dirt on presidential candidate Hillary Clinton in 2016. Democrats expressed concern with his decision not to recuse himself from overseeing the Mueller probe late last year, despite at least one senior department ethics official telling colleagues he would recommend Whitaker do so. In November Mueller's team argued to a federal appeals court that Whitaker's appointment "has no effect" on Mueller's authority. Deputy Attorney General Rod Rosenstein, who has supervised the day-to-day handling of the investigation, is expected to leave the Justice Department in the coming weeks if Barr is confirmed. The decision on whether to compel Whitaker's appearance before the House is a delicate one for Democrats, who are balancing oversight duties with legislating, and working carefully to avoid appearing over-eager to investigate the president, as Republicans and the White House are quick to claim. Rep. Doug Collins, R-Ga., the ranking Republican on the Judiciary Committee, said he hasn't seen any evidence that Whitaker has curtailed the Mueller probe, and accused Democrats of wanting to bring him before the committee "to attack the president." "What's the preoccupation with Whitaker? We've got issues with opening the government, we've got issues in our committee on immigration," he said. "I can't think of conspiracy theories that the Democrats won't investigate." "This is just another witch hunt," he said of Democrats' plans to bring Whitaker up to Capitol Hill. 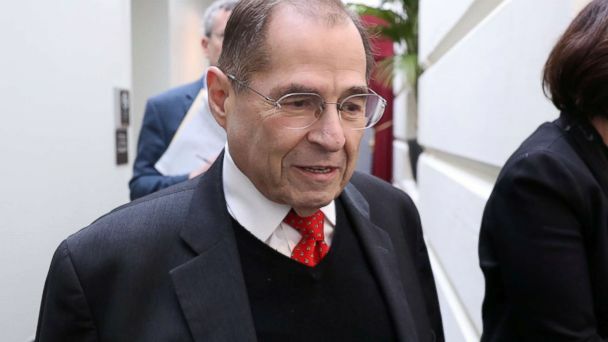 Nadler and other Democrats said that they would still be interested in questioning Whitaker after Barr's confirmation, even if he is no longer serving in the administration. "His role his ascendancy go to questions of obstruction. He's an obstruction of justice witness," Swalwell said.